Police used tear gas to control the crowds as the so-called “yellow vest” demonstrators took to the streets across the country for the 14th consecutive weekend. In Paris on Saturday, officers intervened to form a barrier after a group of individuals involved in the march confronted Mr Finkielkraut and started verbally insulting him. The 69-year-old Jewish academic told Le Parisien newspaper that he heard people shouting “dirty Zionist” and “throw yourself in the canal” (in French). He told newspaper Journal du Dimanche he felt an “absolute hate” directed at him, and would have been afraid for his safety if the police were not there, although he stressed that not all of the protesters were aggressive. Mr Finkielkraut, the son of Polish immigrants, has previously expressed sympathy for the protesters, but also voiced criticism of the movement. He said that President Macron had spoken with him by telephone on Saturday to offer his support. They have since broadened into a revolt against President Macron, and a political class seen as out of touch with common people. The protests have often turned violent, causing damage – including to some of Paris’ most famous monuments. Critics have also accused the police of using disproportionate force. The number of protesters taking to French streets has been gradually falling – but tens of thousands are still turning out weekly to demonstrate across France. 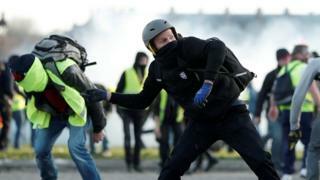 France’s interior ministry said a total of 41,500 people took part in protests across the country on Saturday, including some 5,000 people in Paris, although the organisers of the march said many more attended. “We are 15,000 [in Paris], that means the movement is increasing,” demonstrator Jerome Rodrigues told AFP news agency.